The Capitals looked better than 24 hours prior against the Blues in St. Louis, but the result was the same, as the Capitals fell 2-1 in overtime. The loss was the Capitals third straight. Shot production was up significantly, but the power play and battle at the faceoff dot continues to be a struggle. The Capitals return to action Sunday afternoon when they visit the Red Wings in Detroit. Puck drop is set for 5:00 PM. The Stars opened the scoring with a power play goal late in the opening frame for a 1-0 lead at the first intermission. The Capitals would tie the game with a goal from Lars Eller in the second period for a 1-1 tie at the second break. After a scoreless third, the Stars would win it late in overtime. Capitals bench boss Todd Reirden made a couple of changes to tonight’s lineup, being the second game of a back-to-back set. 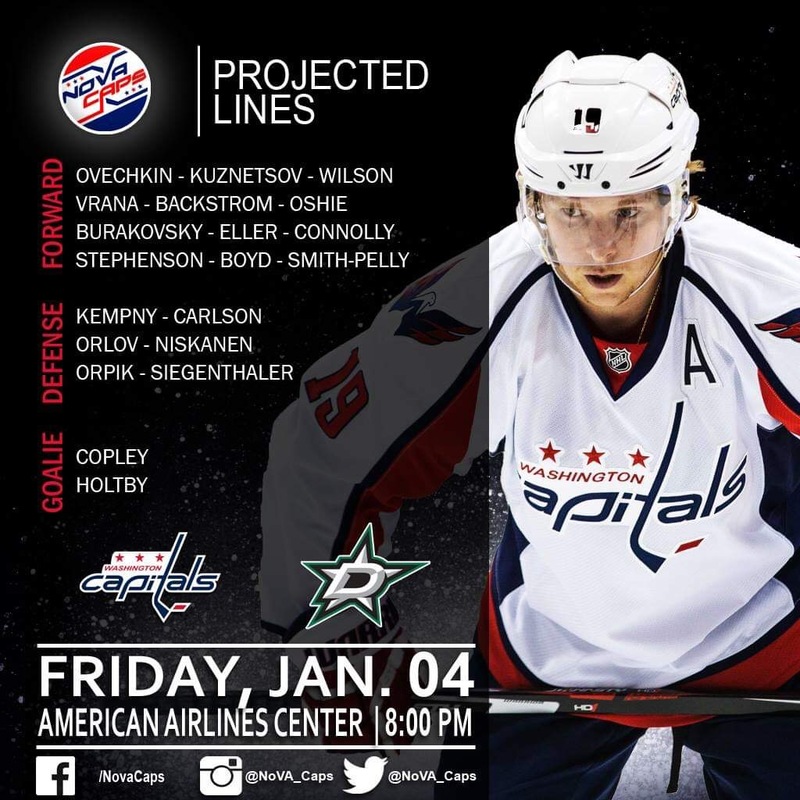 Jonas Siegenthaler replaced Madison Bowey, Travis Boyd replaced Nic Dowd and Devante Smith-Pelly replaced Dmitrij Jaskin. Pheonix Copley got the start in goal. Scratches: Madison Bowey, Dmitrij Jaskin and Nic Dowd. The Stars out-attempted the Capitals 20-9 and led 14-5 in shots on goal in the opening frame. After the first, it was all Caps. 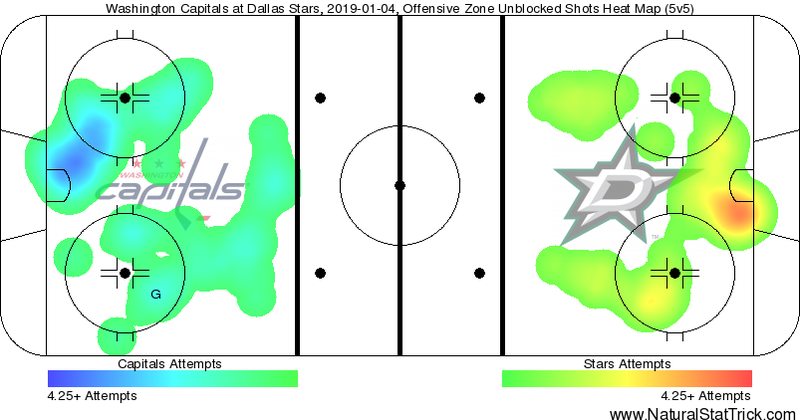 The Capitals out-attempted the Stars 18-12 and led 15-8 in shots on goal in the second period. The Capitals out-attempted the Stars 16-6 and led 14-2 in shots on goal in the final frame. Pheonix Copley was once again very strong in goal, stopping a number of break aways. In the end, Copley stopped 27 of 29 for a .931 save percentage. Anton Khoudobin was outstanding. Stopping 36 of 37 for a .973 save percentage. The Capitals struggling power play was blanked in seven of the last eight games coming into tonight’s contest. Since December 1, the Capitals power play was ranked 27th in the league with a 12.2% conversion rate. The Capitals power play once again came up empty, going 0 for 3. There were signs of some improvement, with increased zone time and improved chances, but in the end, the power play did not succeed. The Stars were 1 for 3 on the power play. The Capitals entered the game tied for last (Montreal) in faceoff winning percentage at 47.3%. Dallas entered the game with the league’s seventh best winning percentage at 51.8%. The stage was set for a rough night at the dot for the Caps. The Capitals were once again dominated at the faceoff circle. The Stars won 61-39%. (35-57). 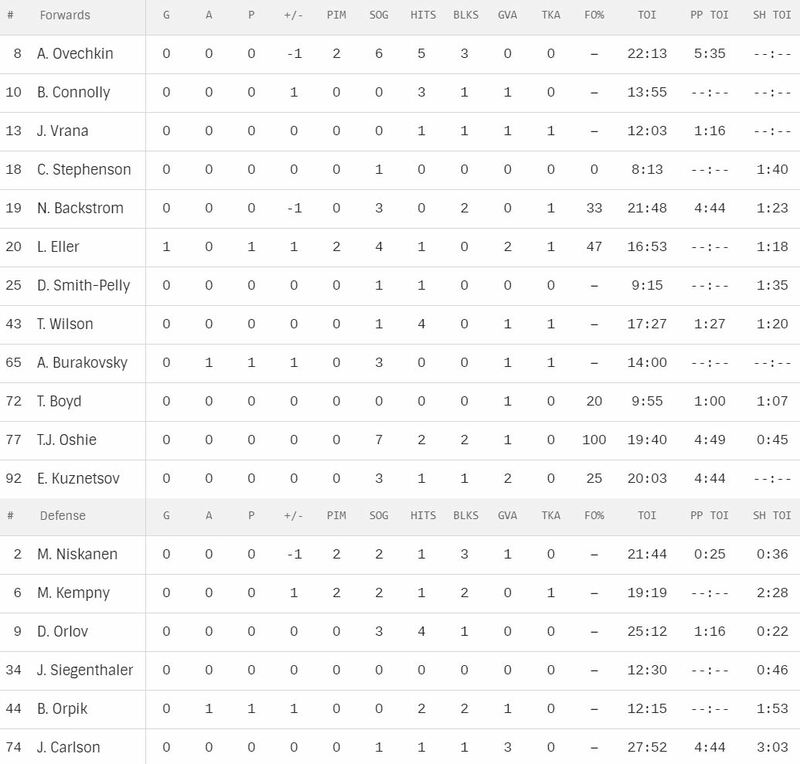 Chandler Stephenson was 0 for 1, Nicklas Backstrom was 5 for 15, Lars Eller was 7 for 15, Tracis Boyd was 1 for 5, T.J. Oshie was 5 for 5 and Evgeny Kuznetsov was 4 for 16. Alex Ovechkin set a career high tonight with his 204th consecutive game today (started Oct. 13, 2016 at Pittsburgh, surpassing 203 games, Feb. 3, 2006 through Oct. 25, 2008). With that goal, Eller is now tied with Jannik Hansen (109) for third place on the all-time goals list by a Danish born player. The Capitals last regulation win in Dallas was October 17, 1995. 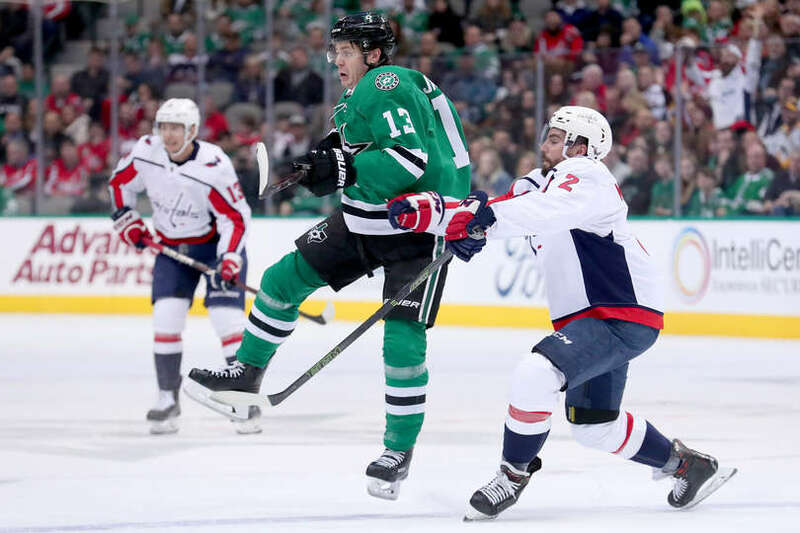 This entry was posted in News and tagged Dallas Stars, Inside The Numbers, Jon Sorensen, Lars Eller, Washington Capitals. Bookmark the permalink.